An immediate media storm ensued surrounding her comments and the future first lady was branded as angry, unpatriotic and anti-american. Several Conservative talking heads used Mrs. Obama's comments, as an opportunity to tell us how they really felt about the soon to be First African-American First Lady. "She, Mrs. Obama did not experience any of the 1950 segregation. To say something like that and to get a complete pass; people acting as though this is something unique and revelatory, that this is some special couple. Did she not feel proud about the Berlin Wall coming down? Has she not felt proud about the way we came together after 9/11? It is unbelievable to me that -- and this goes to the root, I think, of some of the things we discuss here frequently, and that is people taking this country for granted, not having any understanding what it took to get this country where it is." "What do you mean for the first time in your adult life you're proud of your country, and not just because Barack has done well, but because you think people are hungry for change? Have you suffered? Have you suffered, ma'am? I'm tired of people putting down this country. I'm tired of people pretending that this is still pre-slavery, pre-segregation, pre-internment. That we're in a depression. I'm sick and tired of people ignoring the enormous progress we've made in this country and sacrifices one generation after another have made to make this a more perfect country. I'm sick and tired of it. I don't give you a pass. You finally have hope for this country? Well, that's somebody else's kids over there, fighting and dying so you can go to an Ivy League school, so you can send your kids to a private school, so you and your husband can have your day in the limelight, and to make millions of dollars. Stop putting down my country! Stop putting down my country when there's so many great people doing so many great things so you can have it all, so we all can have it all. No more pandering. Enough is enough. This may work with the radical left, but it doesn't work with me, and it doesn't work with most Americans." "This is in the country that has paid the price, the blood, the sweat, tears, the financial burden to beat back fascism, Nazism, imperial Japan, totalitarianism, the former Soviet Union, medical breakthroughs because of the greatness of America, the average American raises his family provides goods and services, and a standard of living second-to-none, and for the first time in my adult life, I am proud of my country only because my husband has a chance to be president? That is offensive. I think she owes America an apology." "Remember it was Michelle Obama who said she is only recently proud of her country, and so these are very anti-american views." Many people opposed to Mrs. Obama's comments took a mathematical and historical approach to dissecting her comments. Several people concluded that Mrs. Obama's adult life began 26- years prior to her comment and within those 26-years, there have been several occasions or historical instances prior to February 2008, when Mrs. Obama should have been proud of her country. In fact many of the opposing comments cited the fall of the Berlin Wall and even our nations unity after September 11th as events that should have made Mrs. Obama proud prior to her husbands historical Presidential run of 2008. For Mrs. Obama to have any feelings at all or for her to be willing to give her husbands supporters an honest appeal of her thoughts, is a simple no no. This is anti-American and unpatriotic. These are the same people who like to pretend that America has this squeaky clean image and has never done any wrong and if America did do something wrong, it was ultimately for good. In comes Republican Presidential candidate Michele Bachmann who has spent the last two and a half years galavanting around the country, spewing anti-American rhetoric. Michele wants to take HER country back and running for President is the only way she knows how to do this. "In the last 48 days, as I've been everywhere from Spencer to Storm Lake to you-name-it. We have been there and Ames as well. As we've been all over the state, what we have seen is a restoration of that dream. And you have restored in me, my faith in America. I see on the television destruction all across the country, but not in Iowa. It doesn't matter what city I'm in. I see happy, confident, optimistic people." So what exactly has changed between October 2008 and August 2011? Oh, I know. There is a black man with his black family living in the White House, hopping on and off of Air Force One and Marine One, attempting to make the United States of America a better place and Michele Bachmann can't handle it. Really Michele? So until you landed in Iowa last weekend and secured your Ames Straw Poll victory, you had no faith in our country? This Ames Straw Poll win and the packed room of "Tea-Party Partriots", RESTORED YOUR FAITH? Let me get this straight!! Our country unifying in November 2008 to elect Barack Obama, the first African-American President of the United States didn't make you proud Michele? Our country taking the first small step through the passage of the Affordable Health Care Act, to rectifying an atrocity that has plagued the nation for 40+ year, didn't make you proud? No faith at all Michele in our country, to know that people would no longer have to die in the streets, because they lacked adequate health care? President Obama's appointing and the eventual confirmation of Justice Sonia Sotomayor, the first Latina-American to the Supreme Court of the United States, didn't make you proud Mrs. Bachmann. The New Orleans Saints won the Superbowl in 2010, almost five-years post Hurricane Katrina, giving the great people of New Orleans hope and pride. You had to be proud for those great people? You had to be proud to see your Congressional colleague, Gabrielle Giffords return to the chamber on August 1st, only seven months after that fatal day. Michele, you had to be proud last month, when the US Women's Soccer team made it to the World Cup Finals, COME ON MICHELE! Congresswoman Michele Bachmann of the great state of Minnesota, daughter of David John Amble a decorated veteran of our nations military, HAD to be proud of SEAL TEAM 6, for their capture of Osama Bin Laden in May 2011. Don't Throw Stones When You Live in a Glass House! If people were so quick to question the patriostism of Michelle Obama in 2008, then those same people should be questioning the patriotism of Michele Bachmann in 2011. Michele Bachmann is running for President of the United States and her election was launched at a time when she had NO faith in our country. Michele's words, not mine. So this is the person whom the 4823 Iowa Ames Straw Poll voters, want to RUN the country? Someone who looses faith so easily, because a persons ideology, background, religion or morals don't exactly match her own. Welcome to America! We are a melting pot of diversity and people from all walks of life. We are Black, White, Asian, Latino, Native-American, Catholic, Protestant, Jewish, Muslim, Atheist, Gay, Straight, Bi-Sexual, Transgender, Rich and Poor. Guess What? The President of the United States is SUPPOSED to represent all of these people. If Michelle Obama was Anti-American in 2008, then so is Michele Bachmann in 2011. 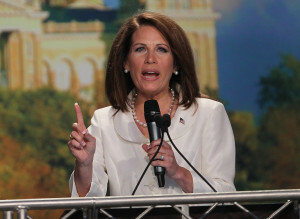 Was Michele Bachmann's remark Anti-American or Unpatriotic? Does Michele Bachmann Hate America? What did you interpret Michelle Obama's 2008 remarks to mean? What do you interpret Michele Bachmann's recent "Restore Faith" remark to mean?